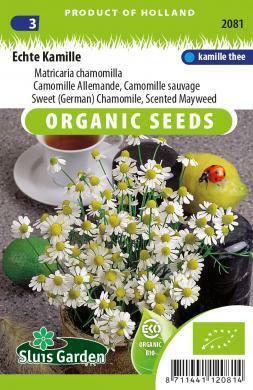 German chamomile has a fairly strong fragrance and contains many essential oils. Harvest the flowers when sunny and allow to dry well. Tea can be made from the dried flower heads. Chamomile is used as a sedative for people with sleeplessness and inflammations. Sow in the garden in rows. Do not cover the seeds, but press down well. Can be easily cultivated in pots.